Ingredients for a ganache are further down. Butter then add milk,then whisk in yeast. Machine or by hand, either way, about 10 minutes. Proof, then gently roll out, cut them out, leave for 15 minutes then deep fry. Here in this picture I am frying the middles. Toss them in cinnamon sugar. In cinnamon sugar. Bonus little delight!! 2 to 3 minutes on each side. 180 celsius. Drain well. Leave to cool. At this stage you'll need to make a ganache. Melt over a double boiler. Very gentle boil, 8 to 10 minutes, give it a good whisk. When fully melted, you will have a glossy thick ganache. 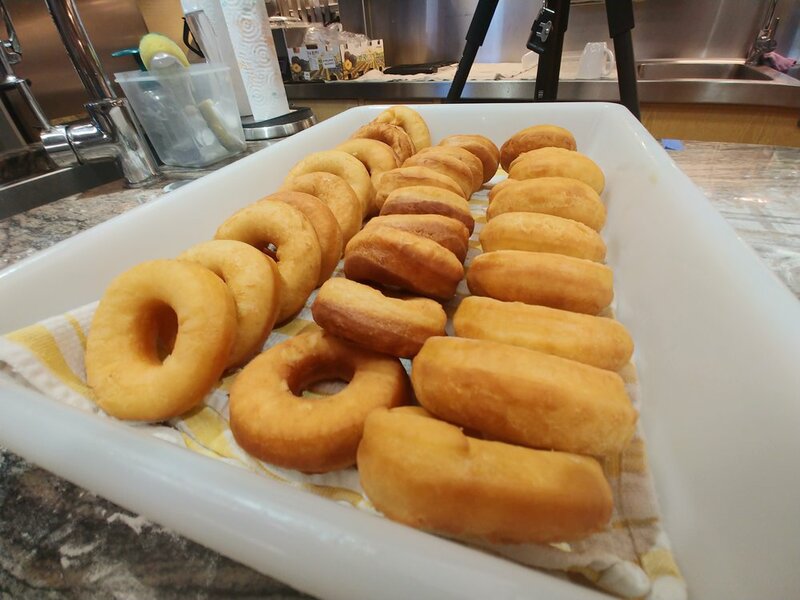 The doughnut and dip the top half in ganache and place on a tray with a rack inserted. While still wet with ganache, I have topped these doughtnuts with freeze dried raspberries, crunchy bits, sprinkles and crispy bananas. I will try to have a video to go along with it.